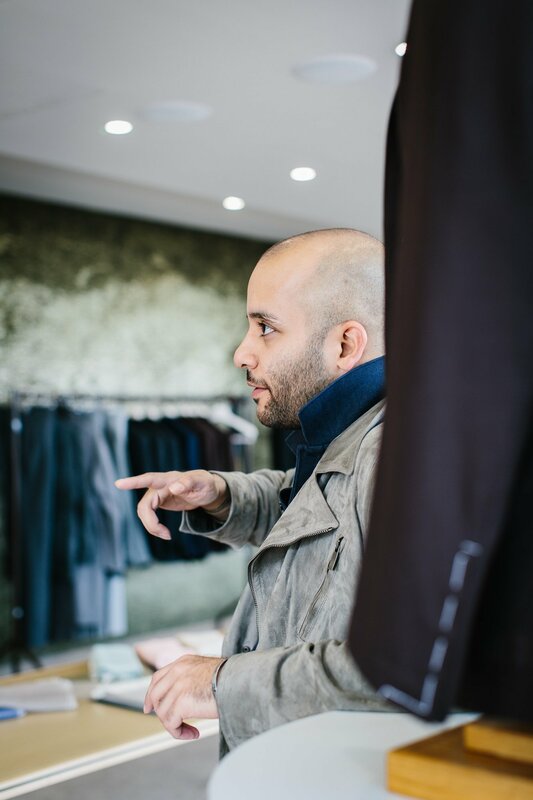 Last week, Agyesh Madan of Stòffa visited London for the first time, in a trunk show alongside Marcus Malmborg (Swedish agent for Eidos made-to-measure, among other things). Eidos is more of a known entity, and we will cover the service more at a later date. For the moment, I’d like to focus on the genuinely original styling, business approach and collection philosophy of Agyesh. Key to the Stòffa collection is its versatility of style and colour. The first thing you will notice (or will have noticed) is the suede jackets. 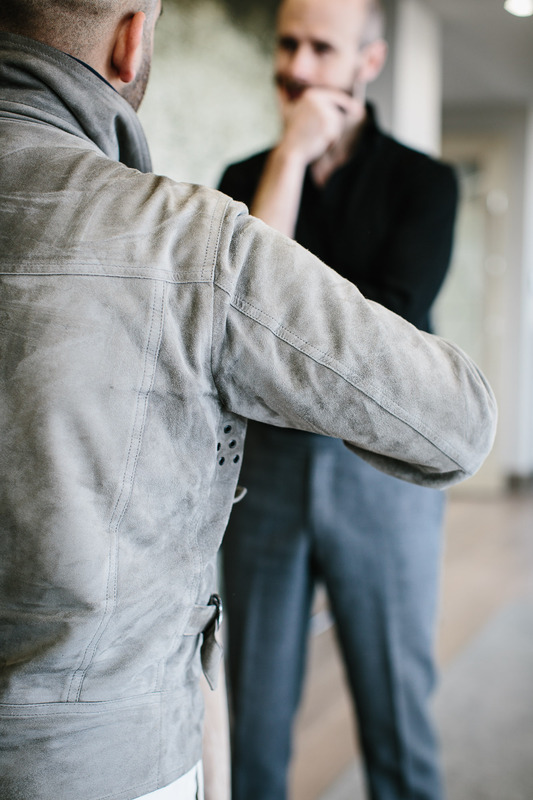 Probably flight jacket or asymmetric jacket, most likely. In a dark brown, cream or light grey. And nonchalantly worn - complemented by a polo shirt, chino and perhaps leather bag. 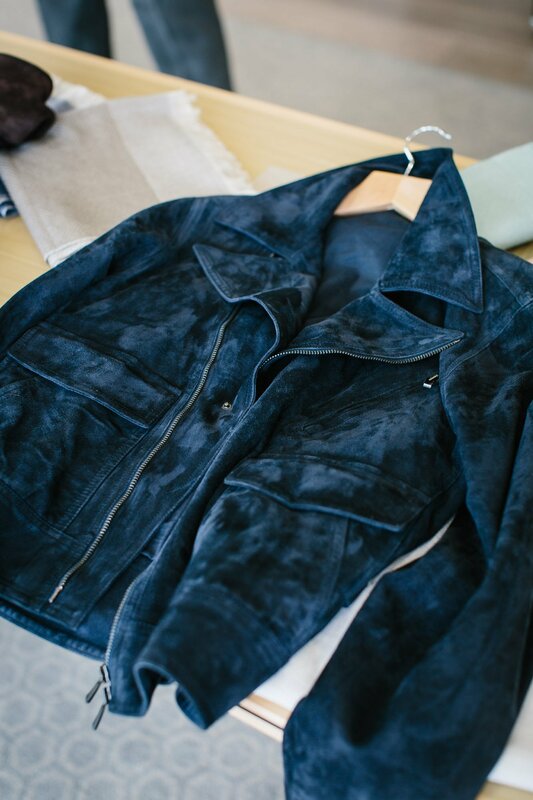 The suede jacket is the most striking piece, and gets people most excited (including me). Particularly as it is made to measure, delivered within 3-4 weeks, and from what I have seen, fits very well when it is. But there are in fact four designs of outerwear (a field jacket and an overcoat also) plus made-to-measure trousers, hats, ties, scarves and handkerchiefs - and the outerwear comes in a range of materials from linen to wool/silk. 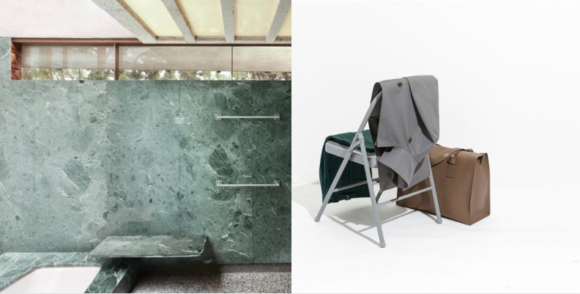 What makes the Stòffa collection seem so versatile, therefore, is not a narrow, tightly edited range but holistic design. 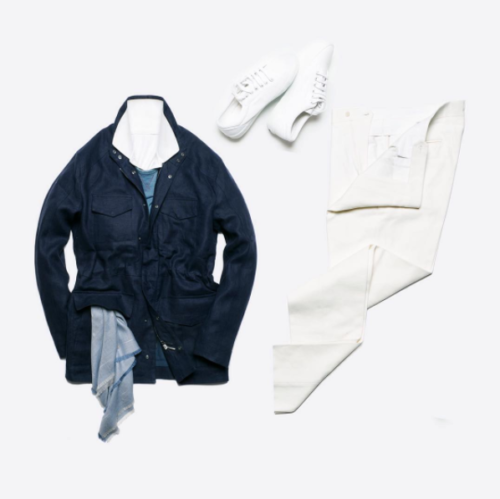 The trousers can be worn with any of the four outerwear pieces, and merely change the look from semi-formal (with a dark coat) to more casual (paler, asymmetric jacket). The felt rabbit or beaver fedoras pair well with any of the looks. And the scarves (in four sizes, and a dozen or so colours) equally. Perhaps the most important aspect of this cohesive design is a simplicity of line, with subtle changes of proportion. The flight jacket is clean and refined, with only slightly oversized hip pockets and collar. 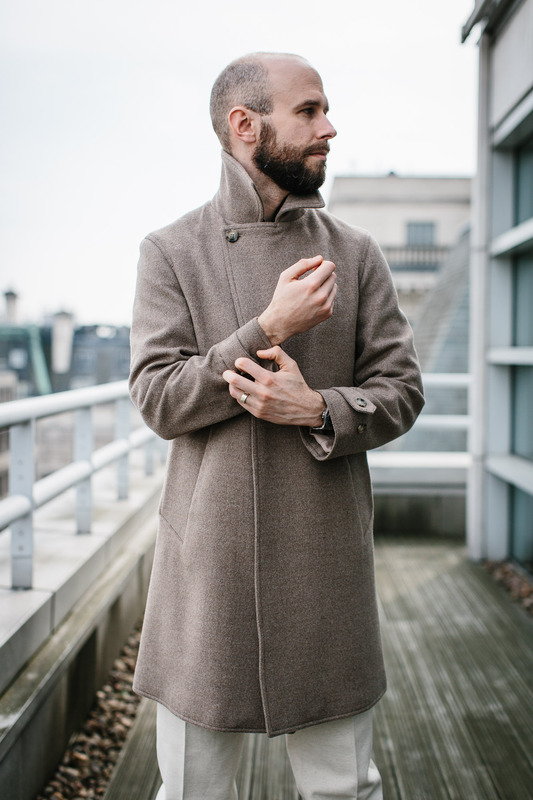 The coat (below) shows genius of line, with angled side seams, oversized pocket openings and two off-centre buttons (one just below the ribs, the other at the collar) creating shape out of otherwise entirely unstructured cloth. In fact, if I could change one thing in the outerwear it would be to remove the side fasteners on the asymmetric jacket, in aid of making it as clean as the other pieces. The mutually complementary colours Agyesh picks are perhaps the most interesting topic of all. But also the area that admits of least analysis. Agyesh himself says it is largely instinctive, something reflected in his references to abstract artists such as Cy Twombly and Joan Miro. And some of his most interesting Instagram posts are those that suggest parallels between natural colours and those found in the clothing. In practice, I find many of his colours - the pale sand, the muted taupe - appeal more than more commercial versions of those colours, often because they are paler and less showy. It also gives a more neutral ground for pops of bright green or turquoise. But it can go the other way. The brown suede, for example, is a touch paler than most mainstream suede jackets, and I would tend to prefer something darker. But that can always be adjusted with the addition of dark-brown or navy, and is mitigated by the simple, classic nature of the pieces. Stòffa has an interesting business model, operating entirely out of trunk shows without any wholesale or retail (other than the odd collab, eg with Drake’s on hats). Agyesh travels to New York, Los Angeles, San Francisco, Stockholm and now London, several times a year. 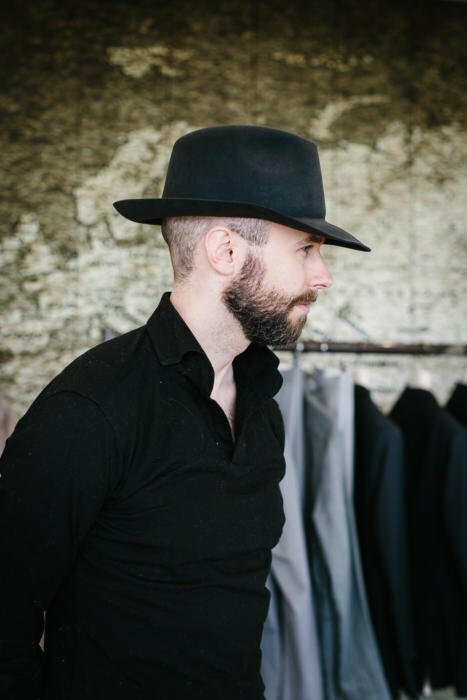 It’s a punishing schedule - he did 41 shows last year - but it enables him to escape wholesale or physical retail, and to offer a speedy made-to-measure service. He aims to be in each city every 5-6 weeks, with time in between to complete any orders and deliver them at the next visit. The next visit to London will be April 21-23. 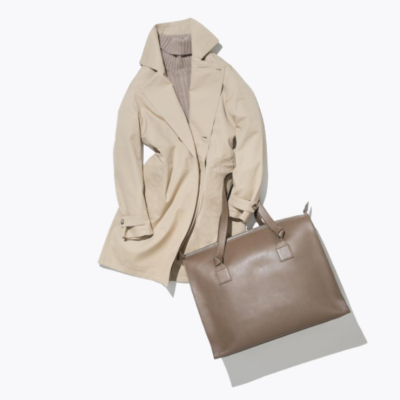 Suede and wool outerwear from $1400 to $2200. 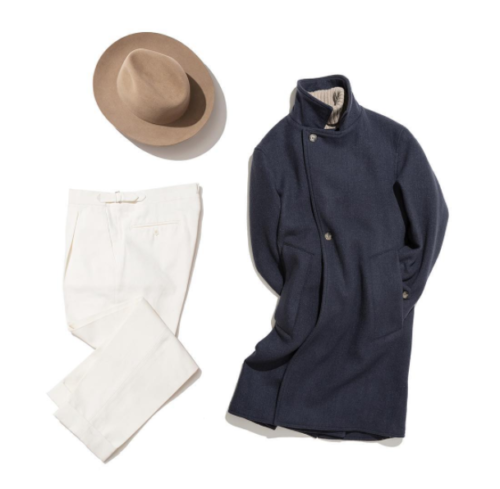 Cotton and linen outerwear from $800 to $1500. Trousers from $275 to $450. There is much else we could go into here, from Agyesh’s approach to product development, to his 800+ days of public product testing on the hats, to his policy on responsible sourcing. But we’ll leave that to another post - after the April trunk show, when I should have something to review, having commissioned a navy-suede flight jacket when we met last week. I will just say in passing that while the hats, trousers and accessories are lovely, they are perhaps less original and interesting than the made-to-measure outerwear, and so I’ll generally focus on the latter. 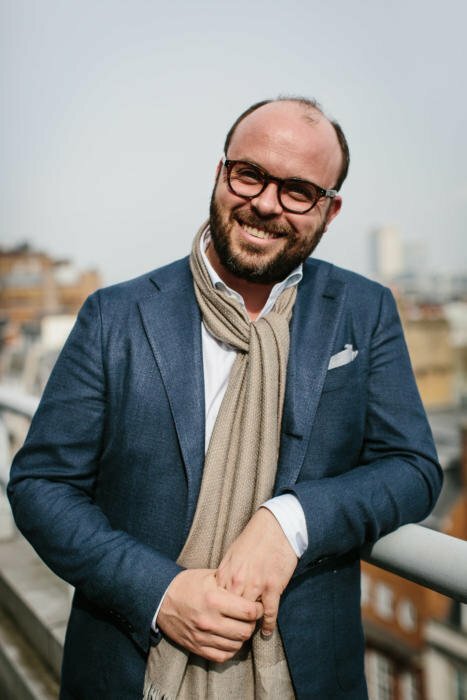 You can follow the discussion on Stòffa: Beautiful, refined, made-to-measure (and now in London) by entering your email address in the box below. You will then receive an email every time a new comment is added. These will also contain a link to a page where you can stop the alerts, and remove all of your related data from the site. As for colours, Simon – what is your take on a red sport coat or blazer? If there’s a link to a previous post, let me know, but I’m curious to know if you think red is a color best left to James Dean and Pee Wee Herman. My thought would be – pale red, rose, light pink, quartz – but not a medium to brighter red. I think it would be pretty hard to wear outside of a beach resort. Go very pale if you have to. I find this mega cool, I have to admit! 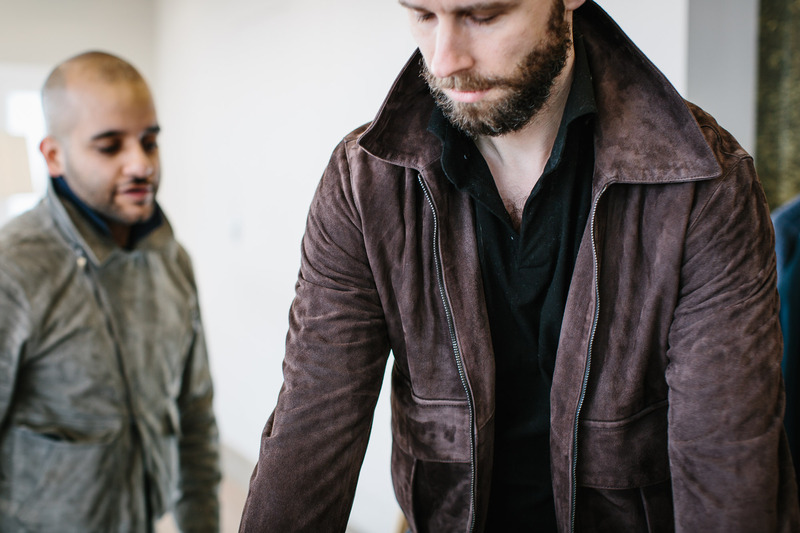 Will we see more picture of the finished suede jacket? From what I can see now, it looks brilliant! Nothing to do with this post, Camps de Luca or Cifonelli, being the two premier French bespoke suit makers. As you have had experience with both of them, who in your opinion is better in terms of style, construction, handwork and so on and so forth. Hi Gohar – would you mind putting this on a relevant post? Many many readers use these old posts for reference, and questions on them further enrich them as reference tools. Where are the best places in london for mtm trousers ? Feature coming up next week – I just picked up a jacket and trousers from them. Look forward to it! Was going to buy some trousers this weekend but now will wait to see what you have to say! Interesting post which has prompted me to book an appointment at the April Trunk Show in London. I’ve always wanted a field jacket but perhaps been put off by the similarity to the safari jackets of the Roger Moore era Bond. Being made from suede somehow distances the Stòffa piece from this. I think the shade of brown worn by you above would give the greatest flexibility of use; would you agree? Yes I think you’re right, followed by the navy which would be smarter. 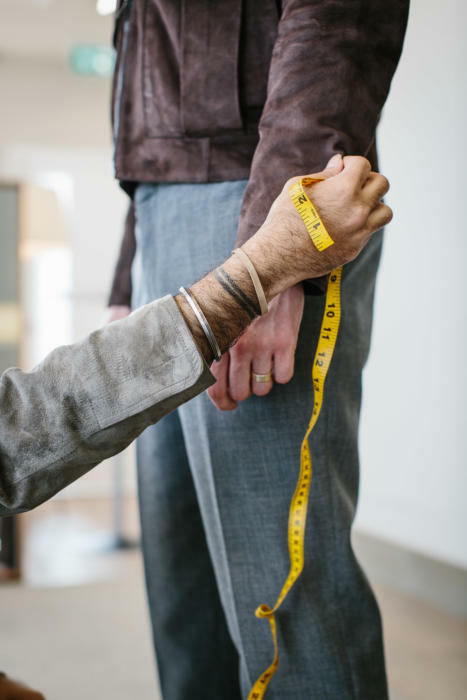 The field jacket is deliberately cut slightly big, in order to be able to wear it as outerwear over a jacket, and then cinch in at the waist to get greater fit when required. It’s an interesting approach that I think works well. I was on your site Wednesday evening and was intrigued by your meeting with Agyesh Madan of Stoffa. I noticed his trunk show calendar included San Francisco and that he was in town the very next day. By Thursday morning I had an appointment for that evening and met with Agyesh. I am now awaiting the delivery, in about four weeks, of a suede field jacket in anthracite. Thanks for bringing outstanding craftsmen like Agyesh to our attention. Keep up the good work. Is the polo your wearing in the 6th photo, a Luca Avitabile model polo but in a black colourway? According to your advice, I am looking at various charcoal hats as a starter hat. Do you recommend rabbit or beaver felt? Do you recommend Stòffa, Lock, Borsalino or Worth for the purchase? What is a decent price point? I primarily want to use it everyday with formal-wear (dressing for court). I am very grateful for your guidance, as always. Beaver if you can afford it. If you want it for more formal wear, not Stoffa or the Lock Travellers. 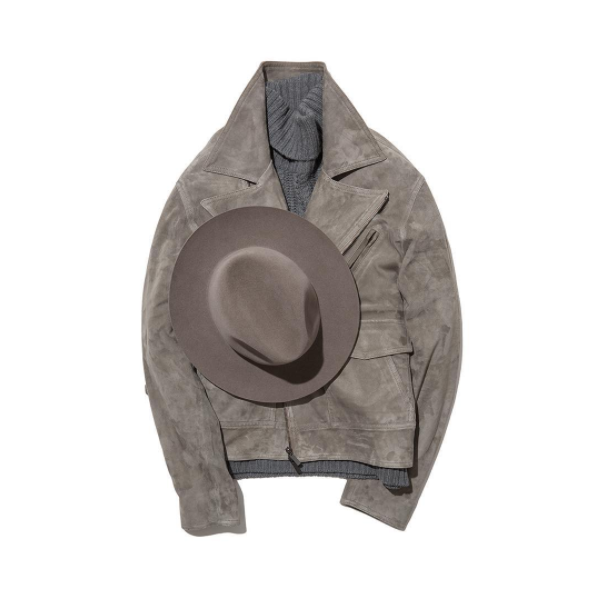 You want a lined hat with a band – from Lock or Borsalino. Wondering where these are made? India perhaps? Or the US? All Italy, including most of the raw materials. How do you judge the quality of suede? Besides the look, are there any palpable traits of premium suede? It’s not easy, and to a certain extent it depends on what you want from it. Softer, thinner suedes tend to be more expensive, for example, but they aren’t as robust as others. Generally, though, the feel of the suede – its softness and supplenes – is a decent indication of quality. Hi Simon, I met up with Agyesh, and was similarly impressed. An interesting but relaxed aesthetic that really works. Ayesha himself a real pleasure to meet. I thought I’d go for something in chocolate brown, but going through the process ended up deciding this was an opportunity to maybe try something different, and went for the taupe suede. Am intrigued you went for the navy? Is that because you wanted something smarter, or felt it would go with more? Or both!? What type of suede do Stoffa use in their jackets? I wondered whether it was lamb or goat leather. Hello Simon – I am thinking of having something made by Stoffa and was wondering if you thought that the asymmetric coat would work in navy suede? only for the shorter jackets. I ordered the coat in water resistant cotton instead (navy) and it will be ready early December. Price US$1200. I recently got the dark brown suede. Was wondering what colour shoes I can wear it with. Will dark brown suede shoes work but risk looking too matchy? Perhaps a lighter shade of brown? Simon I was wondering if you knew which company Stoffa to make their trousers? Is it Munro? Have you tried Stoffa’s MTM trousers at all? Thanks. I’m tempted to give them a try.